Caregivers are welcome to attend all of our "At Home in High Park" programs or you can also drop your child off. There is a 15% discount for additional siblings registered in "At Home in High Park." This is a creative, active group that loves to have outdoor fun! Kids get to experience hands on nature exploration through play, storytelling and crafts. “At Home in High Park” is for homeschoolers who love nature and are interested in learning more about the plants and animals of High Park. We learn about the natural world through direct experience, inquiry, observation, play and stewardship action. Experienced leaders encourage the children to ask questions, nurture their sense of wonder and help them care for the ecology of High Park. Caregivers are welcome to stay and learn with their child! 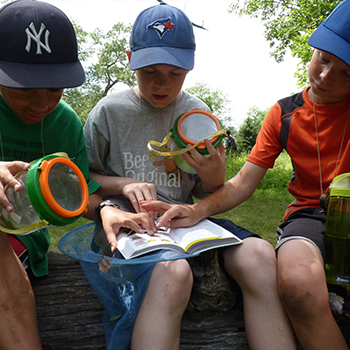 Children learn about the natural world through direct experience, inquiry, observation, play and stewardship action. “At Home in High Park” is for homeschoolers who love nature and are interested in learning more about the plants and animals of High Park. We learn about the natural world through direct experience, inquiry, observation, play, and stewardship action. Experienced leaders encourage the children to ask questions, nurture their sense of wonder, and help them care for the ecology of High Park. Caregivers are welcome to stay and learn with their child! 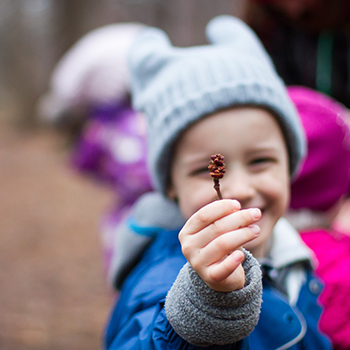 Older children learn about nature through inquiry-based activities, observation and stewardship, following a custom-made academic curriculum tailored to High Park. Programs take place at the High Park Nature Centre at the Forest School located at 375 Colborne Lodge Drive. For all programs, children MUST be of the minimum age of the program on or before the start of the program. Our Nature Clubs are for registered participants who are within that club’s age range only. For our caregiver-accompanied early years programs, we allow “babes in arms” (babies who will be carried) to be brought to the program with their caregiver. If you need more information on our sibling policy, please do not hesitate to contact us at 416-392-1748 or naturecentre@highpark.org. Registration is required for all programs. Registration cannot be confirmed until payment has been received. Programs are filled on a first-come, first-serve basis. We recommended registering as soon as possible after Registration opens to avoid disappointment. If a club is full, you can sign up to be on the club waitlist. In the case that a spot becomes available, we contact the next person on the waitlist. If you would like advance notice of our Registration Dates, you can sign up for our e-newsletter. Please contact us at 416-392-1748 or naturecentre@highpark.org if you have any questions. Requests for refunds made 14 or more days before the start of the program will receive a 90% refund (10% will be retained as an administration fee). Requests for refunds made less than 14 days before the start of the program will receive a 50% refund. Requests made less than 7 days before the start of the program will receive no refund. Requests for cancellations or refunds must be made in writing and submitted to the High Park Nature Centre at naturecentre@highpark.org. A doctor’s note may be required for cancellations due to medical reasons. Refunds are not granted for inclement weather. Programs will proceed rain, snow or shine. Please be sure to dress your child appropriately for the weather as we will be outdoors for most of the activities. Programs will be run indoors in the case of severe inclement weather such as heavy rain, thunderstorms, snowstorms or high winds over 35 km per hour. We also advise wearing long pants, socks and long sleeved tops to protect against poison ivy. If you have any questions please call our office at 416-392-1748. 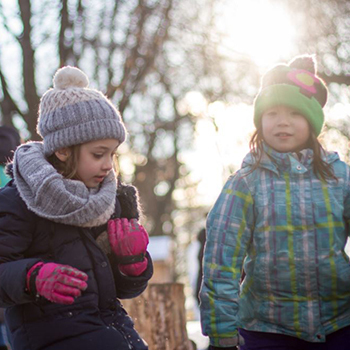 At the High Park Nature Centre we strive to create a safe, inclusive environment for everyone. We want to work with children and parents/guardians to overcome challenging behaviours. Our staff use positive reinforcements, empowering language, and friendly reminders of what appropriate behaviour looks like, sounds like, and feels like. When conflicts arise, we guide children through conflict resolution discussions so they can develop empathy and interpersonal skills. When necessary, staff will discuss with parents/guardians strategies for improving behaviour. However, in some cases a Program Coordinator may need to remove the child from the program. Parents/guardians will be asked to pick up the child immediately. A refund will not be given in this event. Examples of behaviour that will result in removal include (but are not limited to): violence to themselves or others, bullying, damaging property, refusing to follow safety rules, repeatedly running out of sight, or continued disruption of the program.